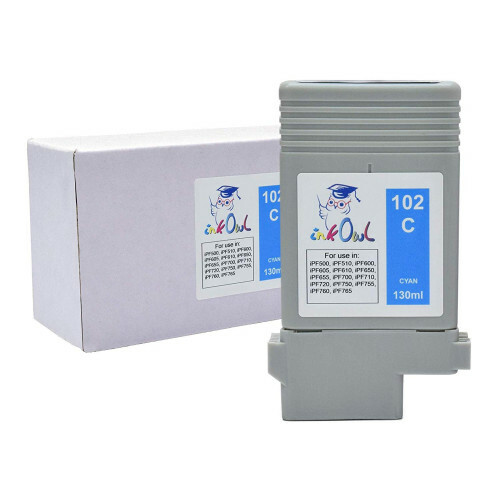 Compatible cartridge filled with 130ml of Ink Owl dye-based cyan ink for PFI-102. Drop-in replacement for the original. New chip installed so all functionality including ink levels will work just like an original cartridge. No ICC profiling required for OEM-equivalent color and performance. High-fidelity reproduction of original colors and color gamut. InkOwl cartridges are built in Canada using ink manufactured in the USA. This allows us to guarantee a consistent product every time you order. The cartridges are not filled with cheap Chinese ink! 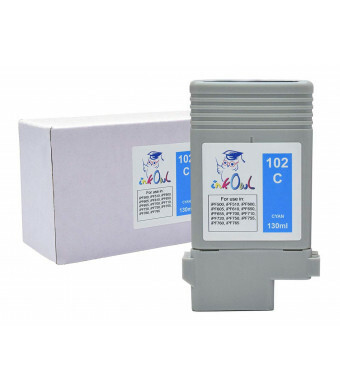 This compatible cartridge for CANON iPF500, iPF510, iPF600, iPF605, iPF610, iPF650, iPF655, iPF700, iPF710, iPF720, iPF750, iPF755, iPF760, iPF765 printers is filled with 130ml of InkOwl's premium-quality cyan ink.